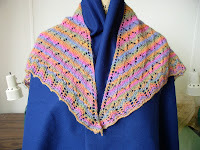 I've been thinking recently about shawl designs, and trying out a couple of ideas. A year ago, I was given two balls of Plymouth Zino, a sock yarn with long color repeats, and was asked to design shawls with them. It's not so easy to create the pattern, while trying not to muddy the colors. Here's yarn #1. This is the point where I gave up on this design. I think it is the third try and I didn't want to rip it out again. 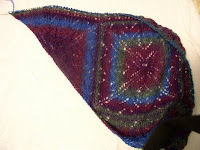 I used one ball of yarn, and it is more of a collar because when I cast on, I misfigured and ended up with 3 triangles. 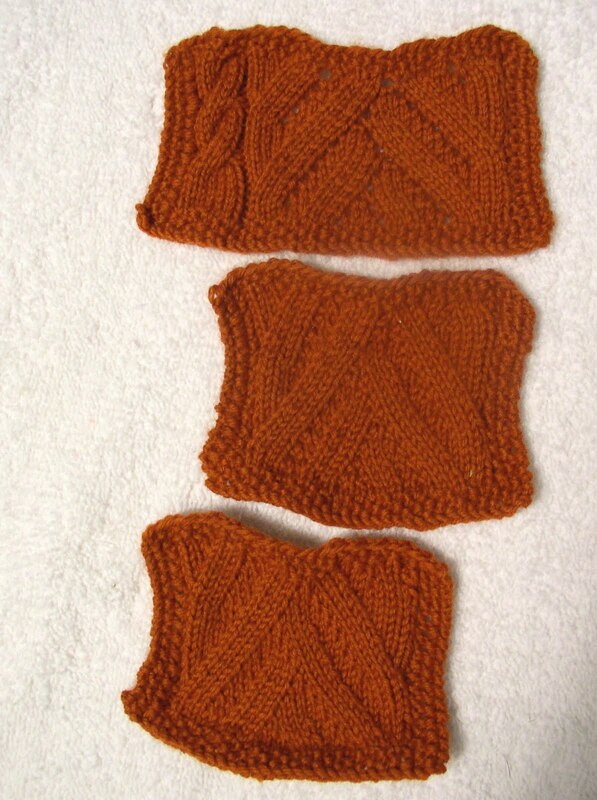 I like the stitch pattern. I'm not sure about the lace edging, or the 3 triangles. I wore the shawlette to TNNA earlier this month and got a lot of positive response, which was nice. I may still sell a version of this one. The other ball of yarn was more muted/darker. I tired separate motifs with this one. 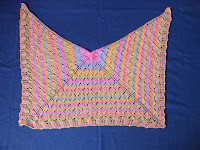 I used a square set in the center back on the diagonal. 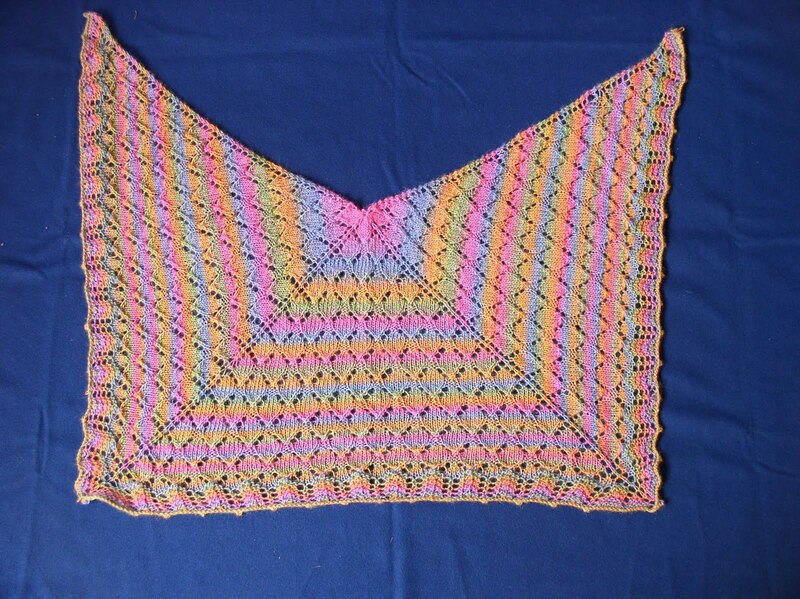 When I finished the square, I left all stitches live. The side motifs are triangles, made of 2 sections of the square. The pieces were joined by looping the live stitches. I don't know if I can explain that in a pattern so someone else could do it. It was a good idea, but somewhat of a pain to do. 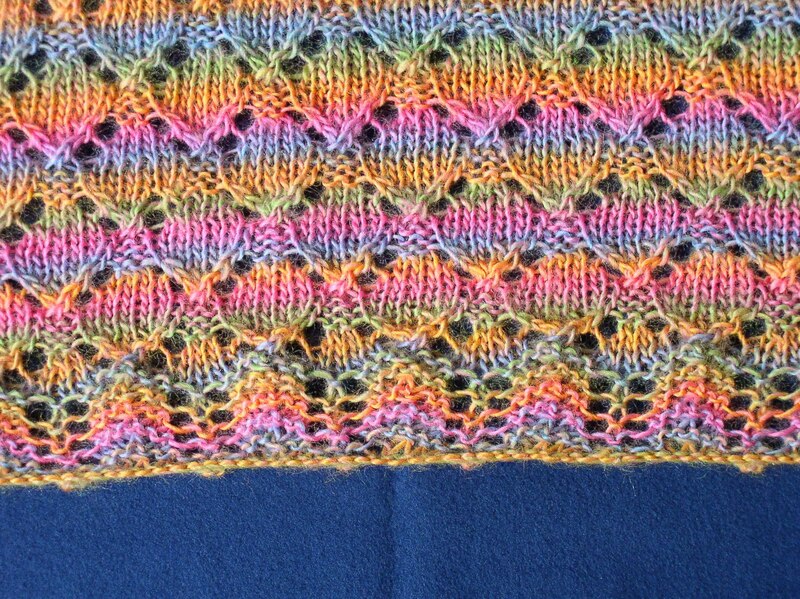 The lace was worked directly on the live stitches. 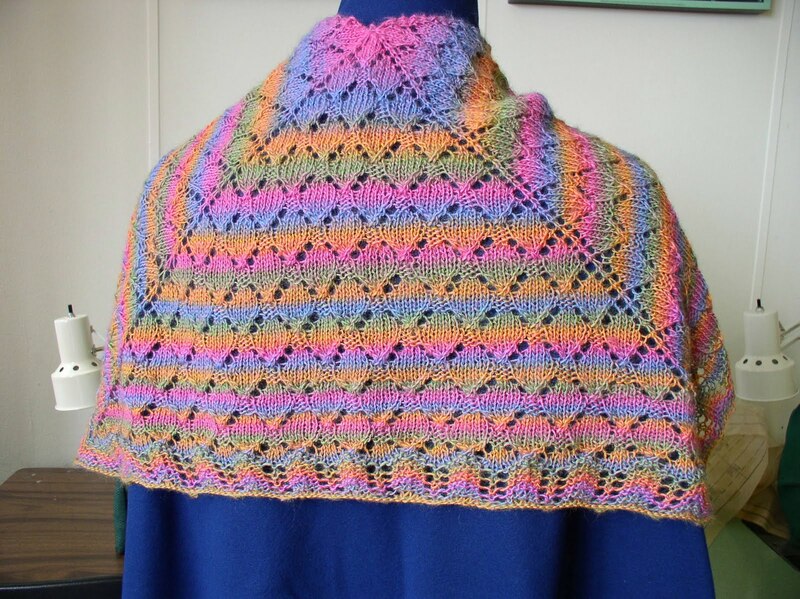 I tried working it perpendicular to the main pattern, which is the most common way to knit lace edgings, but the color blocks looked wrong. I'm liking the lace edging. I tried knitting straight onto the edge, but the pattern is set up so that it doesn't flow well into the edging. The pattern for the square doesn't have a consistent number of stitches between segments, so I may not keep the charts for it. I decided to frame the motif section and then knit the lace edge. It's looking better so far. 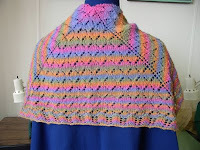 If I use the idea again, I'll try a pattern that has segments with stitch counts that are consistent, so the lace edge can flow smoothly from the pattern in the square. This why I don't do magazine submissions unless I've already worked out the bugs in a pattern. The turn around is too quick for trial and error. I've also designed a couple of pairs of socks after knitting other people's sock patterns for quite a while. I'm happy with this one, but haven't written the pattern yet. The charts are finished in their final form, So I just need to sit down with a little bit of time. I don't need to write the pattern all at once. I can do it in bite size pieces. This sock has a cable on the foot that takes 2 cable needles, so it is fairly complex. 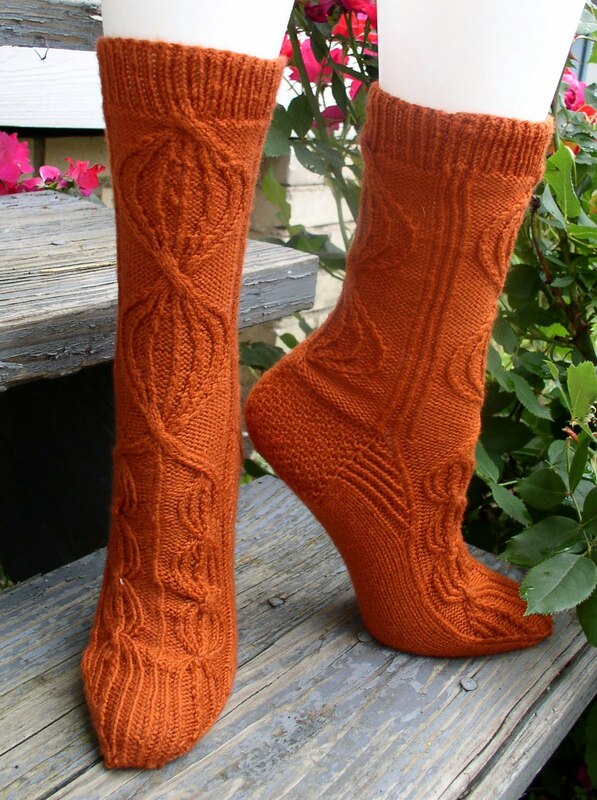 I like how the leg transitions into the foot, but I need a better photo for the pattern. The photo of both socks shows some imperfections that I really didn't see in real life. The lighting needs to show the texture, but not show up problems I didn't know about. I did something a little different with the heel and gusset, and want it to show up in the picture. I'm also working on some socks for my son. Stitch pattern A contained lace and cables. 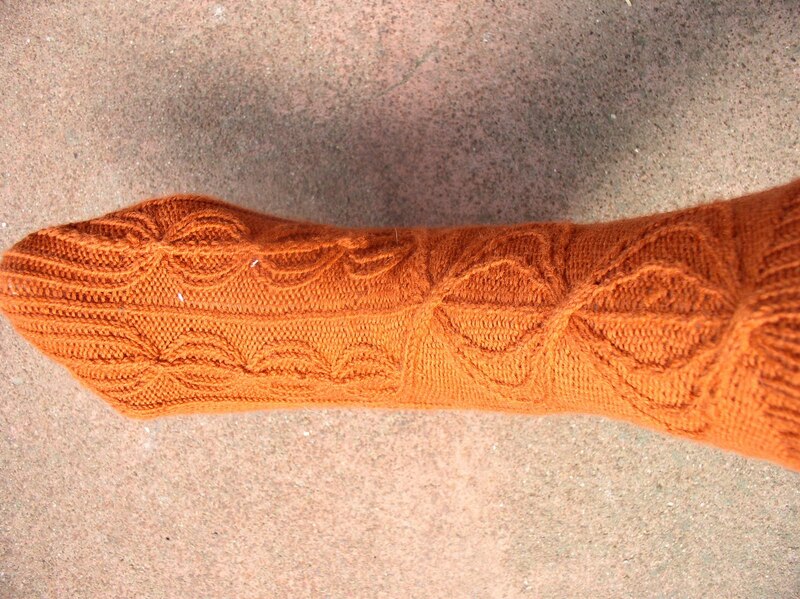 I thought I could rework the pattern to have a non-lace option by replacing the yarn overs with another increase. After 2 swatches, I decided that it was too much work and would not show up with the multicolor yarn I plan on using. The top swatch looks good, but the pattern is less defined on the lower ones. 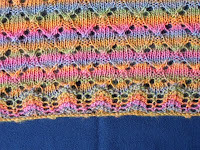 A new stitch pattern has been found that fits the stitch count and will be much easier to knit. There are so many things to think about in creating a design, I was talking to one of my daughters about a child's sweater I have for sale on Ravelry. I designed this one a number of years ago. Recently someone contacted me with math questions about the armhole. I completely reworked the numbers to better fit the pattern repeat, created a new PDF, and uploaded the new PDF to Ravelry and Patternfish. 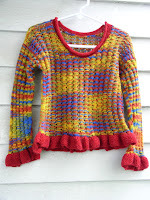 Upon review of the pattern, I realized that I had learned a lot since the original writing. OK that's finished, now what?